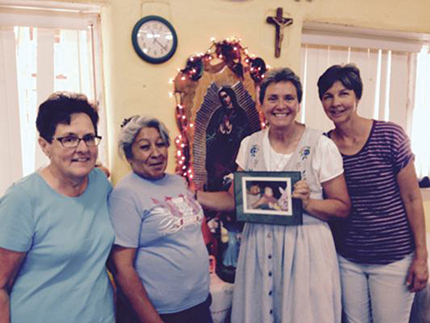 (From left) S. Peggy Deneweth, Gloria Lozano, S. Janet Gildea and S. Carol Wirtz stand with a picture of Gloria’s son, Juan Diego, who is considered the founder of the Santo Niño Project in Anapra, Mexico. Every child to enter the care of the Sisters of Charity at the Santo Niño Project has left their own special imprint on the clinic and touched the lives of those they encountered. One special child, Juan Diego, and his mother, Gloria Lozano, will forever remain in the hearts of the three Sisters of Charity who began the clinic many years ago. When Gloria arrived at the clinic’s doorstep she brought with her a severely underweight newborn with Down syndrome. She came again and again asking for help and advice on how to care for him. And while Juan Diego only lived to be 18 months old, his legacy remains as he is considered the founder of the clinic – which has cared for many more children with special needs and provided a community and safe place for their parents and siblings. In the following article, S. Peggy Deneweth (PD) interviews Juan Diego’s mother, Gloria (GL). PD: What led you to the Sisters of Charity and their clinic? PD: What did you learn and how do you take those learning experiences and carry them forward in your life? at me, here, fighting with MS, receiving therapy, receiving the love and care from the Sisters. I don’t think I can be better than the way I am now with MS.
PD: How have you shared your journey with the families at Santo Niño? GL: I feel very happy to see the love and care that all of the kids receive from the Sisters – not only the special kids, but also the brothers and sisters of the special kids and how they’ve been treated and all they have learned. I see some kids that improve so much. When they fi rst come here they know nobody and they will hide, they don’t want to speak to us, and now, they learn so much. I feel so happy for them – for the kids, for the mothers, for everyone, especially for the Sisters because I know they feel happy about it. PD: Gloria, how special do you feel when you think that your son, little Juan Diego, who you had and you lived 18 loving months with, that he is the one that started this whole Santo Niño Project? We consider him our founder. GL: I don’t know how to explain how I feel because I know that is why he sent me to the Sisters. I know that’s why he came: to touch hearts. He touched hearts here, he touched hearts everywhere. I feel so good about how many hearts he touched, how many people that saw what he was – a little angel. I feel very happy, I feel grateful, but I still miss him and sometimes I wish he was still here with me. PD: You were an instrument that God used to have this special place for his special children. And it was your desire to seek out all of the others.